The constellation Puppis. Roll mouse over to see labels. 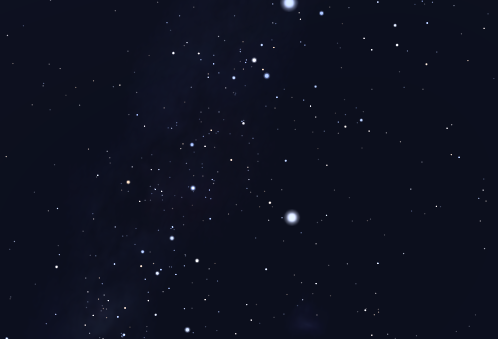 Puppis is visible in the southern sky in the months around January. The Milky Way runs through it and so it is home to numerous of open clusters, including more than 20 which are brighter than tenth magnitude. 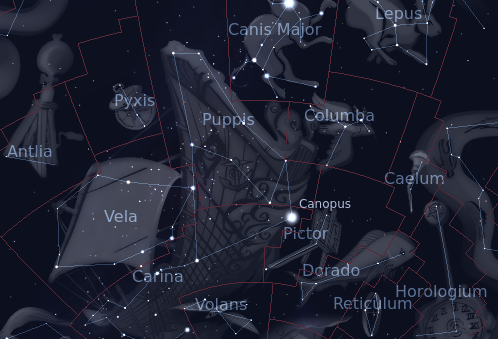 Until the eighteenth century, Puppis was part of the much larger ancient constellation of Argo Navis, listed by Ptolemy among his 48 constellations in the second century. Argo Navis covered over 4% of the sky, an area 25% larger than the biggest modern constellation, Hydra. In 1763, Nicolas Louis de Lacaille divided it up into three parts: Carina, Puppis and Vela. As a result of this relatively recent subdivision, the Bayer designations (α, β, γ, etc) are split between the stars of the three constellations. In classical mythology, Argo Navis was the ship sailed by Jason and the Argonauts on their voyage to recover the golden fleece. Puppis represents the ship's poop deck. Puppis contains the following Messier objects: M46, M47, M93. Puppis contains the following Caldwell object: C71. The following constellations neighbor Puppis: Canis Major, Carina, Columba, Hydra, Monoceros, Pictor, Pyxis, Vela.